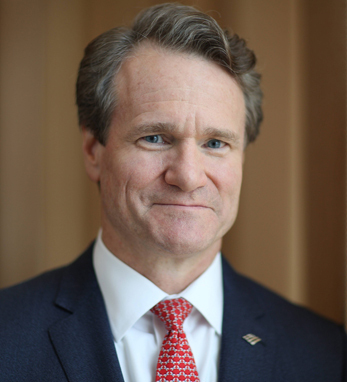 Brian Moynihan leads a team of more than 200,000 employees dedicated to making financial lives better for people, companies of every size, and institutional investors across the United States and around the world. Bank of America is recognized as a top employer, including by Working Mother magazine, the Human Rights Campaign, and G.I. Jobs magazine. Moynihan participates in several organizations that focus on economic and market trends, including the World Economic Forum International Business Council, the Financial Services Forum, the Business Roundtable, and the supervisory board of The Clearing House. Moynihan leads the company’s Global Diversity and Inclusion Council and is a member of the Museum Council for the Smithsonian’s National Museum of African American History and Culture. Moynihan is also a trustee of the Corporation of Brown University. He served as Irish America’s Wall Street 50 keynote speaker in 2009.